Snow time in the Fells! Last week saw the first flurry of snow of the year. In fact the fells got quite a coating, a white blanket on the tops rather than a light icing. 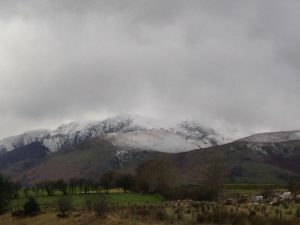 This picture is Blencathra believe it or not. When I got up in the morning the sky was clear and blue and I thought I wish I had brought my phone to take a picture. By the time I took this in the afternoon the clouds had come tumbling in to cover the top of the fell to obliterate her trademark saddle. Still very beautiful though. This week the weather has become even colder. It was -1C this morning when I got in to the car. Somebody told me it is too cold to snow, but I think that might be an old wive’s tale. Nonetheless we have had no more snow this week, but an arctic weather system is in charge hence the freezing temperatures. By tomorrow a polar weather front will sweep in and so the temperatures will rise slightly, but still cold! Somehow that doesn’t sound right polar being warmer than artic, but I’m no expert. Perhaps we might get more snow if the old wive’s tale is true. 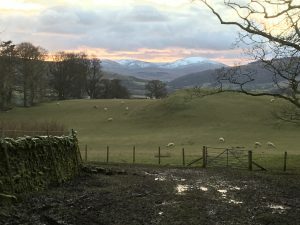 I hav heard people said we can get four seasons in a day in the Lakes and last week we got hail, rain, snow, sunshine, wind and frost. Maybe not all in a day, but we do get proper weather here. This picture is gratuitous because it made me smile. It has nothing to do with the weather, although you migh think she has snow on her nose. 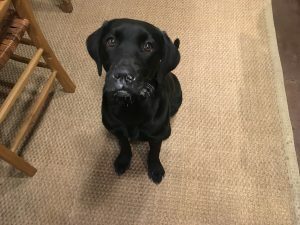 If you have seen earlier blogs you might remember Shadow trying to look innocent after putting her nose somewhere it didn’t belong. And here she is again. This tine she was fouud chewing the toilet wall (which is made from stone). I promise I had fed her that day. She had tried licking her nose several times before I took this photo, but the evidence is there for all to see, despite her innocent big brown-eyes.